We are very excited to announce the availability of these FoMoCo Script Headlights for '69 Mustangs. These are the 5 3/4 inch version used on the four headlight system. They not only fit the 1969 Mustang, but they also fit 1962-70 Fairlane, 1960-70 full-size Ford, 1967-71 Ranchero, 1958-66 Thunderbird, 1968-71 Torino, 1960-69 Comet, 1967-70 Cougar, 1967-71 Cyclone, and 1960-70 full-size Mercury. These headlights have been introduced on the heels of our wildly popular ER-81 65-68 and 70 Mustang Headlights. All of these headlamps are officially licensed by Ford. 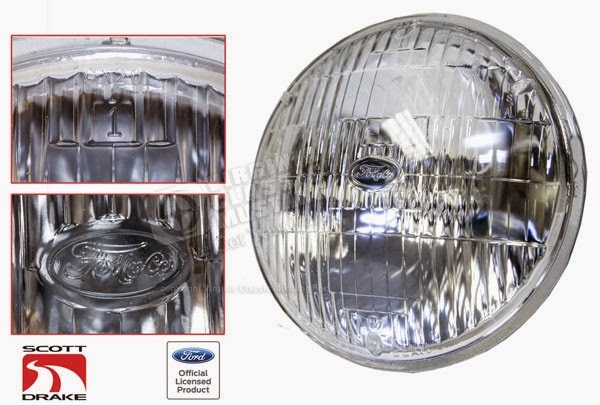 They feature upgraded Halogen performance and feature authentic Ford markings. Halogen headlamps produce more than double the lighting power of original Tungsten bulbs. They are perfect for show cars and drivers providing an original look with greatly improved safety.